Not sure how I missed this 2007 thriller but I am glad that I caught it a few weeks ago. 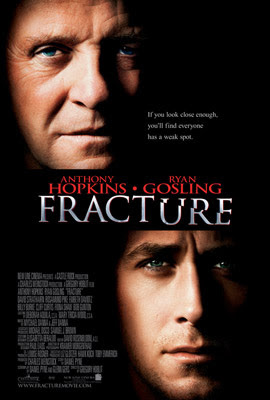 Anthony Hopkins delivers a Hannibal Lector-ish portrayal of a man who kills his wife and gets off on a technicality as he manipulates an egotistical prosecutor played by Ryan Gosling. I much enjoyed the interactions between Hopkins and Gosling. I liked the way that the young attorney's ethics, morality and ego was tested but did think that some of the plot was stretched a bit thin to add a bit of romance to the storyline. You might enjoy this movie if you enjoy a suspenseful story with a bit of courtroom drama. I recommend it and, on a scale of ten, I give it ★★★★★★★. a 7 is not bad. Thanks for movie review. Bob, I hope you and your family had a Wonderful Christmas Celebration. Bob, I'm making a list of Movies you are reviewing for watching in 2011.